There is no translator available for this language pair. Please select again. Recommendation : 2~3 hours per 1000 characters (about 240 words) or more time for advanced materials. Translators selected based on specialty and response rate. Can't find the translator you're looking for? 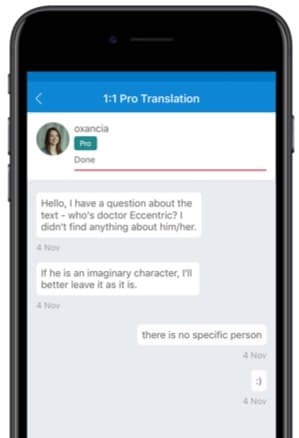 No 1:1 Pro Translator(s) found under your conditions. Select 1:1 Pro translators of each specialties yourself! Receive the estimates directly and communicate with 1:1 Pro translators. or need a systematic management of glossaries. Match with professional translators who passed through strict registration process. Communicate directly with the translator to receive accurate translation. Not satisfied with the translation? Flitto arbitration team will help. Diversely specialized translators are here in Flitto. Organize request based on date and language. Flitto will provide maximum support for satisfactory result. Sign up as business user. Receive real-time notifications and communicate with translator. Flitto will be your best business partner.